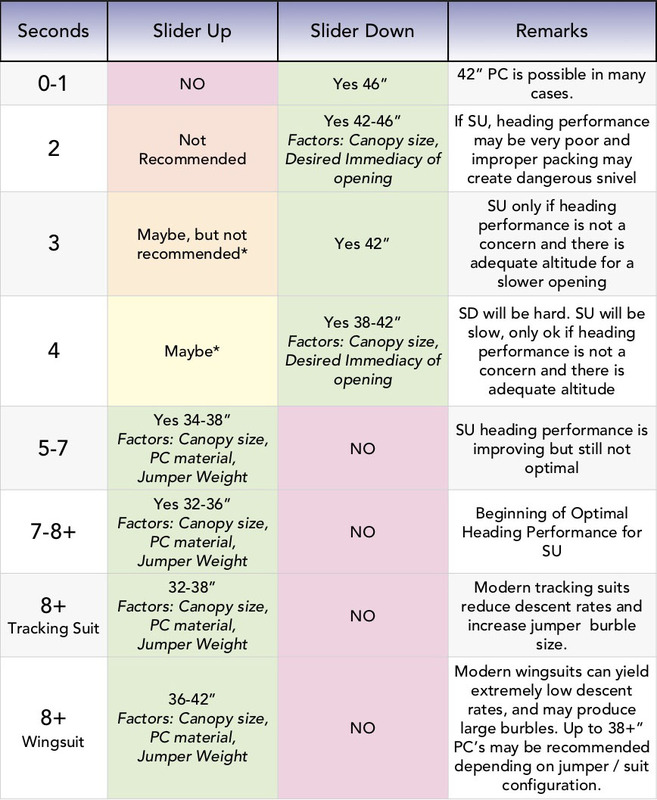 The BASE Jumping Freefall Chart below assumes an average size adult freefalling "slick" (no tracking suit or wingsuit) in a belly-to-Earth configuration. Two charts are shown here. One dates back to the 1st edition of the GBoB, and is more of a clear grid. The other more recent creation (by Simon Perriard, of Switzerland) better illustrates the gray areas that we must consider when planning delays. *There is a small window where slider up or down may be possible. On objects where heading performance is not a major concern, a short delay (3-4 seconds) slider up can work. Low airspeed (less than 5 seconds) slider up openings generally yield the least predictable heading performance. At the 3 second mark, slider down openings start to become uncomfortable. Above 4 seconds, slider down openings are potentially dangerous, to you and to your equipment. This chart points out the hazardous range at 4-5 seconds, where airspeed is too high for slider off, and too low for predictable heading performance from a slider up opening. 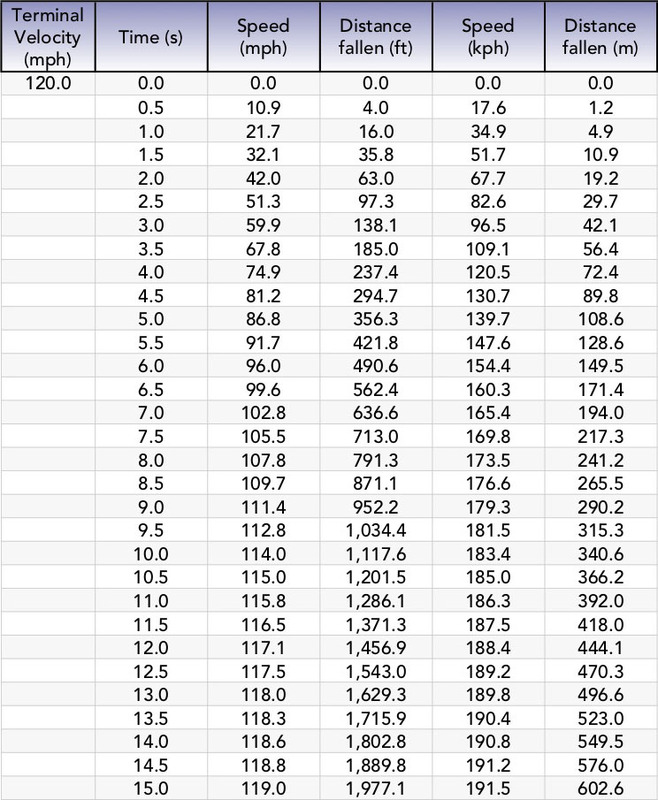 No table can provide definite answers for every delay, due to the nearly limitless variables that exist in jumper configuration, conditions, object height, and equipment. Your PC opens your container and decelerates your packjob until it reaches line-stretch, at which point the inflation of your parachute takes over and your PC’s job is done. The heavier your parachute is, and the lower airspeed you deploy at, the more drag force your PC must create in order to do its job properly. A lighter parachute deployed at higher airspeeds requires a PC which creates less drag. 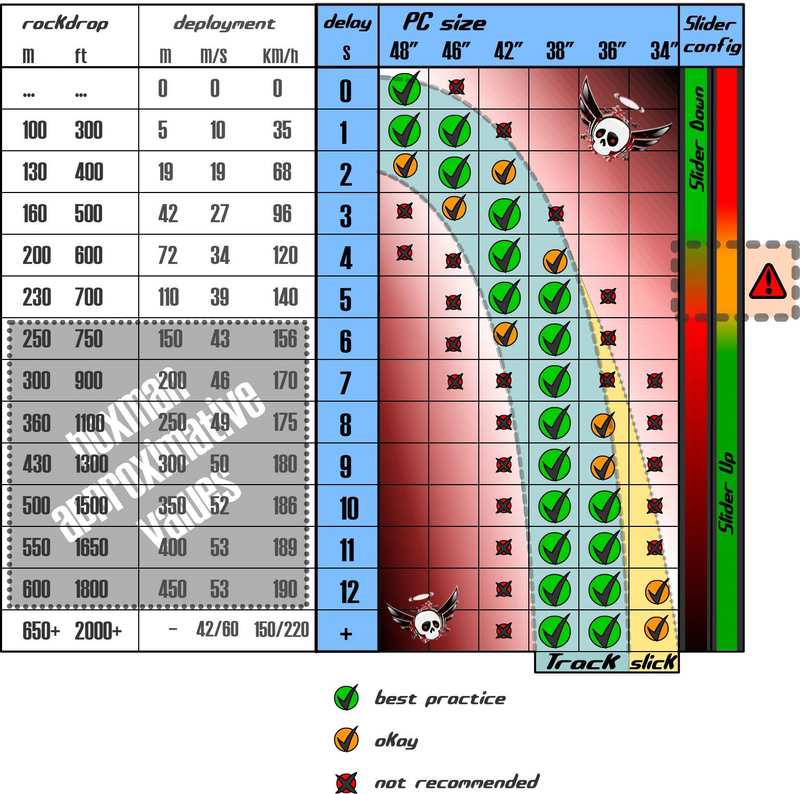 Meeting the drag requirements for a good deployment is done by choosing the right size and type of PC for the deployment airspeed and parachute size/type. An ultralite canopy in a 220 size will not need the same size PC as a standard weight canopy in a 290 size, if the airspeed is equal. Bigger is not always better. A PC is too large for the application when the airspeed it is deployed into is high enough for the drag force it creates to deform the packjob as it is extracted from the container. Referred to as “center cell strip”, PC-induced packjob deformation degrades opening performance. A too-large PC can also lead to an out of sequence deployment, where the slider descends prematurely or line dump occurs. These malfunctions can have severe consequences, including openings that are hard enough to damage you and your equipment. A too-small PC increases the timeline of the deployment process, which causes altitude consumption and gives the packjob more time to rotate off-heading before it achieves line stretch. Packjob rotation is a primary cause of off-headings and occurs due to body position (a packjob which lifts out of a non-level container will not be level in the air), wind influence (sub-terminal openings do not occur in sync with the air mass), and PC drag force & stability. BASE pilot chute sizes tend to be a bit larger than necessary, for reasons of caution. It is thought that it’s much safer to have a pilot chute which is a little too big than one which is a little too small, because it’s better to have an opening which occurs a little too fast than one which occurs a little too slowly. But using an oversized PC can lead to poor openings and damage to yourself or your gear. In many cases where a 42” PC is recommended, a 38” PC will function well. This is not to say that you can choose your PC size indiscriminately because “anything works”. This is only to illustrate that you should not make the mistake of thinking that because a 38” PC works at 6 seconds, then a 42” PC will work better—it won’t.